I won’t tell you about all the activities you should do when in Barcelona, but just one which I enjoyed very much. After hours of hop-on-hop-off buses, miles, and miles of strolling through the cobblestone streets of Barcelona, it’s good to sit down and indulge the finer things of Spanish life by digging deeper into its magnificent culture. It’s time for tasting Spanish wines in Barcelona. The lifestyle in this vibrant city is way more relaxed than the American lifestyle. The people here take their time for their dinners, lunches and they spend more time socializing on one of the terraces. They never seem to be in a hurry. I like that it’s allowed to sleep in late. The normal work day starts between 9 and 10 am and people take their time in the afternoon for siestas and longer lunches. The best fact yet: the great food, lot’s of great restaurants, tapas and of course the fine Spanish wines. I can definitely understand my brother Ferdy and his girlfriend Claartje trading in the sunny island life for the relaxed city vibe of Barca! There is no better place do some wine tasting than at Blend and Bottled’s wine tasting table. 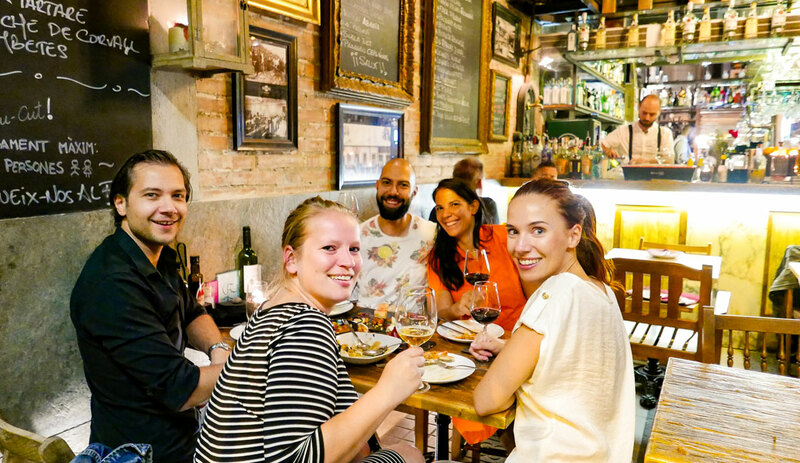 Located right in the heart of Barcelona, you will be surprised by host Claartje’s knowledge, passion, and enthusiasm for the Spanish wines. You will most definitely benefit from it during the rest of your trip. Do you know the wines Spain is famous and loved for? Are there any bells ringing when I mention ‘Rioja’? Or you might ever have had a glass of Cava.. Located in the vivid neighborhood of El Born with delicious restaurants all around. The inviting wine studio has a homey feel to it. I personally loved the raw brick, cellar kind walls. Go as a group or make new friends for the rest of your vacation. A pretty neat way to start your evening. What can you expect when you book the tasting table? In about 2 hours, Claartje served us 5 different wines. I was reunited with my family because my mom, her husband and my brother joined me at the tasting table. We started with a cava to get our tasting buds ready for what’s to come. My taste buds were dancing around and excited for some more. Our glasses are filled with two white wines distinguished for the region. We could compare and describe them before Claartje would tell us anything. I loved the ‘blind’ tasting concept because you are actively searching for what you see, smell and taste. To help you, Claartje gives you a taste indicator that describes all the aromas and flavors. Fun stuff to bring home and try on any wine you open with friends. 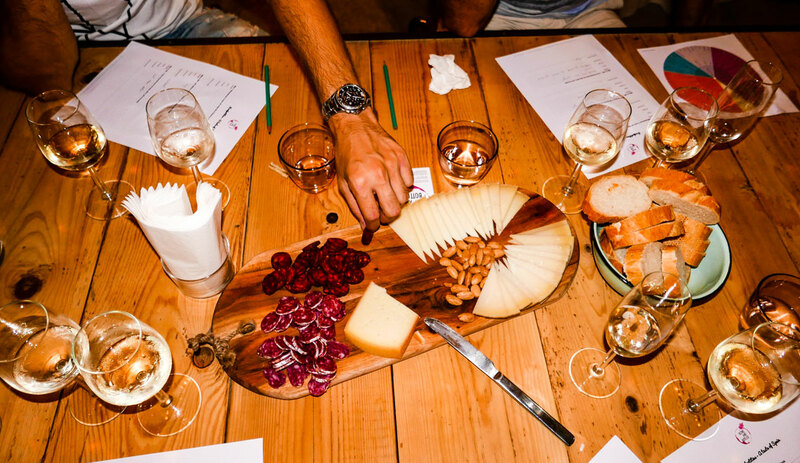 An important and interesting part of the course is how to pair food or in this case tapas with wines. A platter with mouthwatering Spanish treats was served. Delicious cheeses made in the region and Spanish hams and sausages. You notice how food can affects the taste of the wine. Some pairings work well and compliment the wine. I prefer red wines, even though in the Caribbean climate a chilled glass of white wines seems to be the better choice. And we had two more glasses of red to compare and taste. After the blind tasting and food pairing, Claartje will tell you all there is to know about the wines. It was a fun and delicious experience to learn more about the wines and about each other. Claartje has so much knowledge about the wines of Spain. She is very knowledgeable and has obtained a certificate WSET Advanced Level 3, which makes her a pro! You can ask her anything you want to know and she will have the answer. If you are living in Barcelona and you like to have a more in-depth knowledge, Claartje offers various courses. 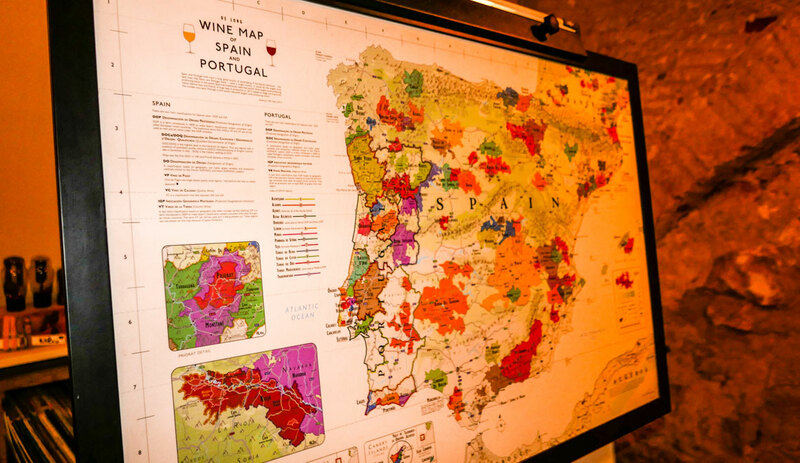 It’s a fun way to learn a lot more of the wine regions in Spain and beyond. At the end of the course, your new obtained knowledge will be put to the test. You will be rewarded with a certificate of completion of the course and you can start using your new gained wine knowledge for a lifetime. Barcelona is a city you have to visit at least once in your life. There are a lot of beautiful highlights and sights you should see and visit. At the end of the day, the amazing food and fairly cheap good wines have spoiled me and I love to keep going back and back. It’s only such a long journey from the Caribbean. And to have a real taste of Spain, I am happy to have been one of Claartje’s guests at her tasting table. Thank you Claartje for the wonderful experience, and I wish you all the best of luck in your wine quest. I can’t wait to head back. Find more information and how to book a seat at Claartje’s tasting table on the website of Blend and Bottled. And for anybody living in Barcelona, Claartje selects the best wines from all over the world. What Makes Sintra so Special?